One of the biggest issues Randy and I have had during the truck driving school process has been the anxiety caused by the ongoing uncertainty about what's going to happen next. A lot of that is unavoidable and, no matter how much you plan and prepare, unexpected things will pop up, each school is different, and each person's experience is unique. I think that's why we all enjoy reading other people's blogs and posts about it. Truck Driving School has been stressful. 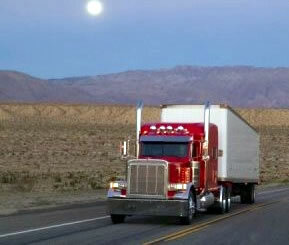 Hopefully hitting the highway will be a nice change from the pressures of the first few weeks of CDL training. - For anyone going to the same school: Randy spoke with the payroll department and found out that the daily wage of $61.43 during the first phase of training is paid 7 days/week. That's nice, we thought it would only be 5 or 6 days/week. It's still not much, but at least we know what it will be so we can try to budget for the first month or so. After that, it's all up-in-the-air again. - During the first phase of training, Randy has to study 10 booklets (75 pages each) and take tests over the Qualcomm. - Also, he said the entire time he's been there has been hot, smoggy and smelly. - Yet another person is miserable because they lied or "left out" info on their application. This one neglected to mention a driver's license suspension for failure to pay child support. - Someone recently arrived at the school from New Hampshire (LONG bus ride), so the closer schools must have been full. - For couples: We've also been discussing, in spite of how difficult it's been at times, how healthy this experience has been for our relationship. Our phone conversations have become nearly all "quality time", and we have each become more adept at existing independently. Who knew truck driving school could double as marriage therapy? ;) One big thing that's missing is "quiet time", where you just hang out and don't talk, but you can't do that over the phone. We've also talked about how important it is, for couples, that both people are totally "on board" with the decision to do this, because it can be very stressful. To everyone I know who is getting ready to begin school or training soon: Goodluck and you know I'm thinking about you! This guy is older (60's?) and he should have known better, but he must be desperate. He already has his CDL , he completed the training, he was all ready to sign a lease and sign on with the company. But then they find out he lied on his application (claims he "forgot"). He had some kind of traffic infraction/license suspension back in 2003, but he never paid the fine or cleared it up. He just moved to another state, got a different license, and never looked back. And now he just wasted a whole bunch of time and money, and he's looking forward to a long bus ride home. Dumb, dumb, dumb. Thanks to everyone on TruckingTruth for all your help! Randy is really beginning to appreciate the advice I pass on to him, and it has given him comfort to know that I've got intelligent, experienced people helping me as well. :) It IS helpful here, and usually positive and friendly. I have to admit there have been times, during the first 3 weeks of this experience, where I began to feel that the entire trucking industry might be orchestrated by a bunch of mad scientists conducting some kind of evil psychological experiment. And we (the students, drivers and their families) are their human guinea pigs. ;) Seriously though, it's been a wild little ride so far, and I'm sure that will continue.